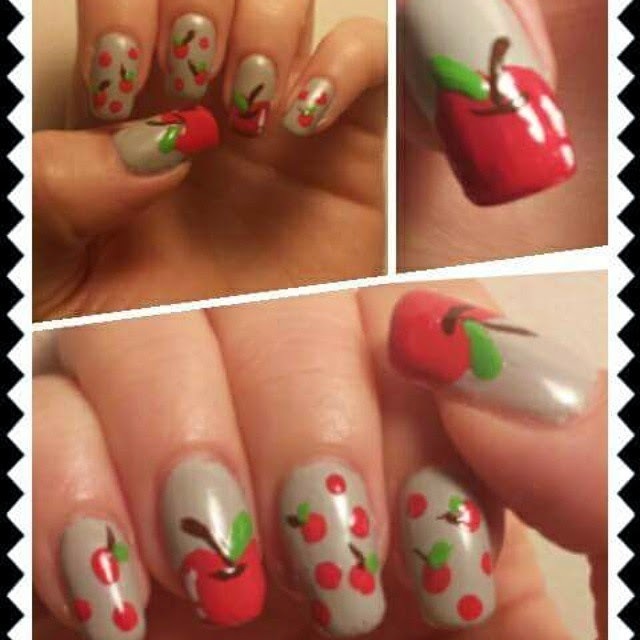 Fruits on nails are the cutest thing ever! Here I used a greyish sand color as a base, but I think a white would look great too. I painted the big apple directly with the brush with a red polish, making two curves, starting from the side towards the centre. I then added the stem and leave with green and brown stripper. And don't forget about the white line and dot (I call it the exclamation mark) to draw the "shine" on the side of the apple. And you are done! For the other nails, I put some red polka dots, then simply added the stem and leave on random dots. The finished look is more fun and non-uniform, which I always try to do!